There are currently 238 people online. Acer reveals the AC700, this Chromebook will ship later this month for $349.99, while a 3G model will hit the market later this summer. For this price tag you get a 11.6" system with Intel's Atom N570, 2GB RAM, and 16GB flash storage. Seems like a pretty poor deal compared to budget laptops. Acer America today debuts the Acer AC700 its first Chromebook in the United States and its first product running Google's Chrome-based operating system. The Acer AC700 ultraportable delivers blazing boot times and instant access to the Internet. 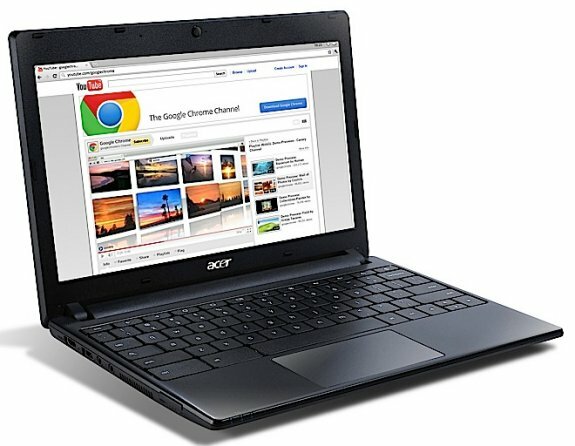 The first in a planned line of products that will utilize Google's Chrome operating system, the Acer AC700 Chromebook is ideal for savvy mobile consumers, educational institutions, and business people that spend most of their time on the Internet for cloud computing such as using web-based email, uploading photos to sites like Flickr and Picasa, and keeping up-to-date on the latest news and events. The new Acer AC700 provides WiFi connectivity, a sleek thin and light form factor, long battery life and excellent HD playback. "We are pleased to be one of Google's leading launch partners delivering a new experience in cloud computing for customers of our new Acer AC700 Chromebook," said Arif Maskatia, CTO, Acer. "As a leader in the mobile computing space, we strive to offer customers the widest range of mobile computing devices to support the many ways our customers connect to their world. The Acer AC700 represents the future of computing as it shows how they can access the cloud to vastly improve the simplicity, security and speed of their online experience." "Acer's expertise in technology and hardware make them an ideal partner to bring one of the first Chromebooks to market," said Caesar Sengupta, Director of Chrome OS, Google. "The Acer AC700 Chromebooks are built for people who want a fast, simple and secure web-based computing experience." The Acer AC700 tackles every task with incredible speed. It boots in less than 10 seconds and resumes almost instantly, so users immediately start enjoying their always-on Internet connection. The Acer AC700 running the Chrome operating system is designed to defend against the ongoing threat of malware and viruses by employing the principle of "defense in depth" to provide multiple layers of protection, including sandboxing, data encryption, and verified boot. Sharing and collaborating on the Acer AC700 is easy. With online applications such as Google Docs and Calendar, customers can share media, collaborate on documents and projects, and share their work and personal calendars. Plus, because customers save their documents, files, photos, video and more in the cloud, they are protected from data loss if an Acer AC700 is physically damaged, lost or stolen. Designed for ultimate mobility, the Acer AC700 is portable and sleek. It weighs only 2.95 pounds and measures a mere one inch thin, so it can be easily taken anywhere as it fits into a backpack, briefcase or purse. The combination of a simple and intuitive Chrome operating system and full-sized keyboard makes the Acer AC700 incredibly easy to use and navigate. The oversized fully-clickable touchpad allows customers to conveniently click anywhere on it as they navigate the Internet. The Acer AC700 is ready for instant fun and entertainment. The Acer AC700's integrated HD 1.3MP webcam w/ LED indicator is great for video chatting and conferencing, as well as capturing video and photos for sharing online. It supports the latest web standards and Adobe Flash 10.1 video. Everything looks incredibly crisp and clear on the Chromebook's 11.6-inch HD Widescreen CineCrystalTM LED-backlit LCD. Plus, the Acer AC700's HDMI output lets customers stream video from the cloud to high-definition TVs and displays. Business and education customers will appreciate the simplicity and manageability of the Acer AC700, since files can be shared or edited from one device, saved to the cloud, and then accessed from another Chromebook or any device with a web browser. In addition, Chromebooks are great for accessing web-based tools, applications behind the firewall, and virtualized desktops. This eliminates the need for a large hard drive and helps protect against data loss since everything is stored remotely. IT managers will value the security and simplicity benefits that the Acer AC700 provides. Also, customizing and managing a fleet of Acer AC700s can be done from one web-based console in an efficient, timely manner. The Intel Atom N570 dual-core processor and 2GB of DDR3 memory provide the performance to speed through the web, access files, enjoy video and more. It has a 16GB SSD for storing files as well as the millions of Chrome apps and games from the Chrome Web Store. The Acer AC700 also has two USB 2.0 ports and a 4-in-1 card reader that accepts popular flash storage, so customers can play music and video directly from the card, or upload photos, video and music to their favorite sites. The Acer AC700 Chromebook is available this month in the United States at Manufacturer's Suggested Retail Prices starting at $349.99. A model with 3G broadband wireless capabilities will be coming this summer.